The Runway Convention Tote has a large open main compartment. Also a front pocket with Velcro closure. Double 24" handles. Reusable. Great for tradeshows and conventions. 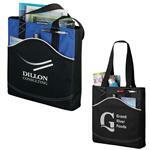 The bag is reusable and a great for conventions and trade shows. 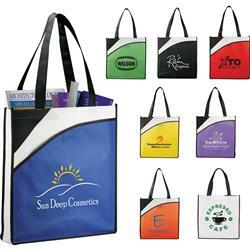 Make this tote stand out at your next convention by adding your personal logo! 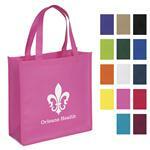 Typical Imprint Area(s): 8" x 8"
80 gsm non-woven polypropylene recyclable tote bags. Great size for trade shows.